The Deutsche Bank crisis was seemingly ignited in mid-September when the US Department of Justice announced its intention to fine Deutsche Bank $14 billion to settle claims of wrongdoing during the mortgage crisis of 2008. Last week, it was reported that Deutsche Bank was on the verge of reaching a settlement with the Justice Department which would reduce the fine to $5.4 billion. Nevertheless, and regardless of the amount, with Deutsche Bank’s total capitalization at $18 billion, it’s clear the bank does not have sufficient capital to pay such a hefty fine. The fact is that troubles within the Eurozone banks, and specifically in Deutsche Bank, have been brewing for a while. Deutsche Bank’s stock has shed more than 40% since October 2015 on fears over its balance sheet. It has been pegged by the International Monetary Fund as the biggest system risk to the Eurozone banking union. In Italy, the banking crisis has been dragging on for months (and a resolution seems nowhere in sight), with the country’s banks holding roughly $404 billion (€360 billion) of underperforming loans. But perhaps the worst banking crisis is brewing in Portugal. According to the Financial Times, Portuguese banks are in dire need of capital and, even more worrying, Portugal’s banking crisis is weighing heavily on the creditworthiness of Portugal’s government which might, in fact, be forced to rescue the distressed banks. Certainly, Portugal’s anti-austerity government isn’t doing much to bolster investors’ confidence. 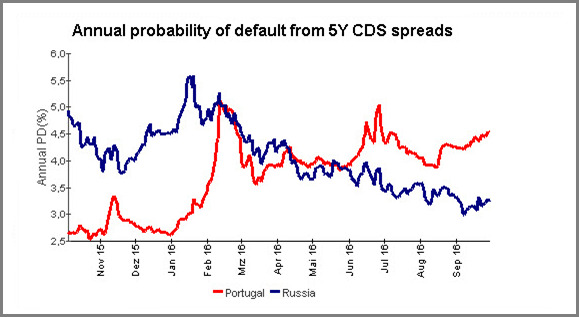 Investors’ fears over Portugal have recently escalated so much that Credit Default Swaps, an important gauge of credit risk, are pricing in a sovereign default of Portugal as more likely than even Russia, with its battered economy. And, as Eurozone banking authorities are slow to move, the banking crisis continues to escalate. On paper, Eurozone banks, according to their own reports of tier 1 capital, are sufficiently capitalized. However, a mere examination of their stocks strongly suggests otherwise. 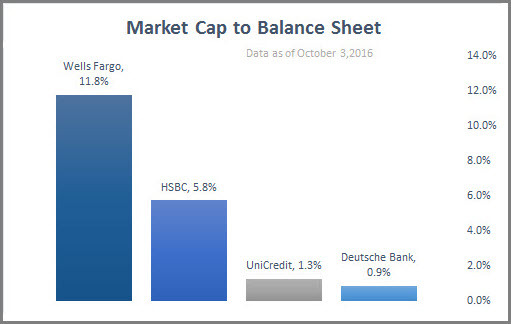 In the chart below we have divided the market capitalization of some of the largest banks in the world compared to their balance sheet. The lower the ratio, the less capitalized the bank. In other words, the bank’s equity is smaller than the liabilities on its balance sheet; therefore, the bank has many underperforming loans which would need to be written off. It also means that if the bank does write off the bad loans then perhaps it will have insufficient capital to operate. The comparison of Deutsche Bank, Germany’s largest bank and UniCredit, Italy’s largest bank, to Wells Fargo in the United States or HSBC in the United Kingdom underscores the severity of the problem. While Wells Fargo’s market capitalization is roughly 12% of its balance sheet and HSBC’s market capitalization is 5.8% of the total balance sheet, Germany’s Deutsche Bank is less than 1%, and Italy’s UniCredit is barely above 1% at 1.3%. Simply put, the Eurozone banking system needs to write off bad loans and immediately move forward with a rescue of the distressed banks by the respective governments, alongside the issuance of emergency credit lines from the ECB. The immediate repercussion on the Euro is risk aversion. Until the health of Eurozone banks become clearer, and until Eurozone governments properly recapitalize their banks, we could see elevated risk aversion which, of course, will favor the Dollar and the Japanese Yen and to some extent, the Swiss Franc. Moreover, with governments being forced to rescue their banks and with credit and liquidity at risk there is a risk that the sovereign debt burden could rise in some Eurozone countries. The ECB might then be forced to add more liquidity which means more Euros in circulation. Together, all of that means more debt, more money printing, slower credit growth and unsurprisingly, a weaker Euro. The EUR will once again lose altitude and might move to retest the 1.05 low as the crisis escalates. The sell-off might be eased over the mid-term as it is unlikely the ECB and European governments will leave the Eurozone’s big lenders to topple like dominos. But, on the long-term horizon, there is a big question mark. If the cleanup in Deutsche Bank and other distressed Eurozone banks is swift and effective, credit growth will return and with it Eurozone growth; then the Euro could recover. But, if the cleanup winds up being slow and messy, this could leave the Eurozone economy with insufficient credit to grow and that, of course, will have a negative impact on the long-term outlook for Euro, which already looks dim.